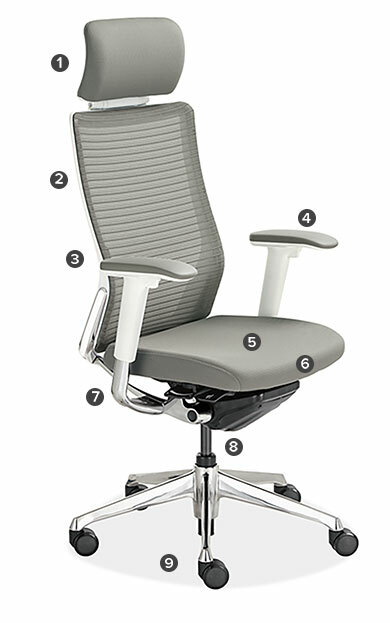 Under its simple, timeless design lies an advanced ergonomic solution. Our Choral office chair allows you to alter seatback tension with just a flick of your wrist. Its multi-density foam seat cushion is softer in front for thigh comfort and firmer in back for enhanced support. Enjoy support from an optional headrest that features four inches of height adjustment to promote healthy posture. Choral is a modern office chair option with easy personalization. This chair offers an optional headrest that provides an additional four inches of height adjustment for back and neck support in a reclining position. This chair offers reclining capabilities that reduce stress on your back and encourage you to move throughout the workday. Form-sensing mesh offers custom lumbar support. This chair also mimics the natural curve of your spine to provide the greatest amount of lower back support when seated, which is an important feature if the chair is used frequently or as a primary task chair. Armrests offer extra support throughout the workday to reduce strain on your upper arms and neck. This chair has 4-way adjustable armrests to complement its design and provide the right support. Adjustable arm height, depth, width and pivot accommodate individual preferences. This chair’s multi-density foam seat cushion is softer in front and firmer in back for enhanced support to minimize pressure on your thighs and knees to ensure lasting comfort and proper circulation in your legs. Easily adjustable tension control regulates the effort required to recline. This is an especially helpful feature if the chair will be used by multiple people, as it easily adjusts to accommodate personal preferences.